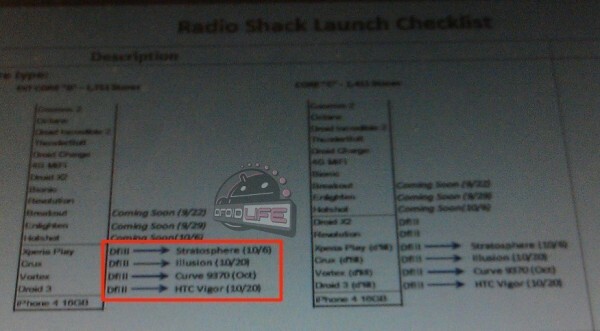 Last night we got a random tip suggesting that the HTC Vigor was to be rebranded as the DROID Incredible HD and would be out on October 13. Whether that date and name are legit remains to be seen, but we know now that RadioShack is at least expecting to see the device as the “Vigor” on October 20. Well, via direct fill anyway. And if that is indeed the case, then I would say that Verizon must be planning a pre-order for it that week? Something to consider. Just over a month away, folks. And as to not shun the Epic 4G Samsung Stratosphere, we should point out that it also made The Shack’s list and is expected to be available via d-fill on October 6. So much for this being a slow Fall?